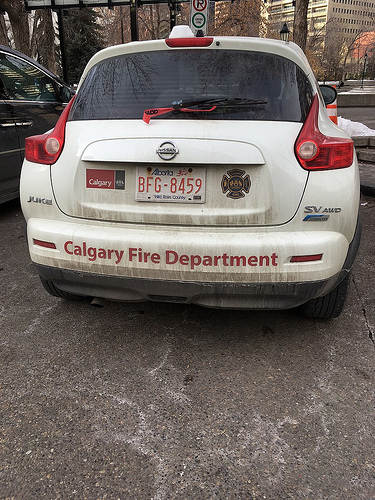 "Calgary Fire Department, where's your emergency?" "Emergency? I'm just calling to order a new log burner"
Simple, any sign of a fire, call Gary. They need to save water for the fires. Big Friendly Gary's first day on the job. Yet another photo of the back of a motor. Is this a car rear move? Their slogan is, "Let it burn." Paddy would of got just a telling off for not washing the fire service vehicle; instead of the sack, if he had not argued that he couldn’t find a hose. Big Fat Guy driving this one. Thumbs up for the Calgary Fire Department. Cleaning the car wasn’t high on Gary’s list of things to do, getting his wife’s body out of the boot without anyone seeing him was his main priority. "What a bunch of hosers."